The 11th Meeting of the IAC Scientific Committee: A group of 25 Delegates and experts from 13 countries in the Western Hemisphere assembled in Lima, Peru to attend the Inter-American Convention for the Protection and Conservation of Sea Turtles (IAC) 11th Scientific Committee Meeting (SC11). The meeting took place from 24 -26 of September 2014, at the “Dirección de Hidrografía y Navegación de la Marina de Guerra del Perú”, and had the support from the “Instituto del Mar del Peru (IMARPE)” under the leadership of Mr. Jorge Zuzunaga, president of SC11. The SC11 meeting discussed the progress in the implementation of their 2014 Work Plan concerning fisheries interactions with sea turtles, sea turtle stranding, climate change and impacts on sea turtlehHabitats, and Exceptions. Scientists reviewed the exemption presented by Costa Rica in their 2014 Annual Report about the harvest of Lepidochelys olivacea eggs at Ostional beach, and provided recommendations to the management plan for this exception. The Scientific Committee developed two technical documents, “IAC Nesting Beach Data Analysis (2009-2013)” and the “Recommendations of Manuals for Handling of Sea Turtles on Board of Fishing Vessels “, which will be soon available on the IAC website. They also approved recommendations on environmental parameters that can be taken on index beaches to monitor the impact of climate change. The Marine Debris Working Group was created; they will analyze issues of the impacts of marine debris on sea turtles. Dr. Diego Albareda (Argentina) was elected as Chairman of the Scientific Committee and Lic. Francisco Ponce (Chile) as the Vice - Chairman. Coiba National Park in Panama, a Refuge for Hawksbill Turtles in the Eastern Pacific: The Hawksbill (Eretmochelys imbricata) turtle was believed to be extinct in the Latin American Pacific coast, however recent research shows its presence, although it is still in low numbers, with an estimation of less than 500 nesting females from Mexico to Peru. In July 2013, an international and inter-institutional team decided to work collaboratively in Panama in the search for Hawksbills. 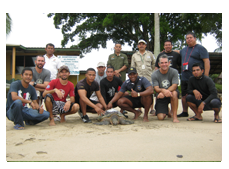 The team is comprised by personnel from NOAA (National Oceanic and Atmospheric Administration) from the United States, the Eastern Pacific Hawksbill Initiative (ICAPO), “Campamento Tortuguero Eco Mayto A.C” from Mexico, the Aquatic Resources Authority of Panama (ARAP), the National Environmental Authority (ANAM) and the National Naval Service (SENAN) from Panama. The group visited the Coiba National Park also a World Heritage Site at the beginning of September 2014 and observed 100 hawksbills. The team fitted a satellite transmitter on a large male that was named “Mali". Panama as member of the IAC will start a sea turtle monitoring program in this protected area in short-term, considering the high abundances found. For more information in Panama, you can contact Marino Abrego, biologist from ARAP, and Panama Delegate to the IAC Scientific Committee. 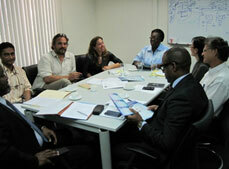 IAC participates in WWF’s Caribbean Marine Alliance Annual Meeting. IAC’s Secretary PT, Ms. Veronica Caceres, participated in the Caribbean Marine Alliance (CMA) annual meeting from June 9-13 2014 in Paramaribo, Suriname. The meeting aimed at starting the implementation stage of the CMA and identifying cooperation opportunities with key stakeholders in the region. The IAC Secretary presented some of IAC’s activities, its committees’ work on the Member Countries, specifically in the Caribbean and describe the process to ratified IAC; in order to identify collaboration opportunities and create an implementation plan. The Caribbean Marine Alliance is a regional initiative created by several WWF programs and offices, such as: WWF Mesoamerican Reef, WWF Cuba, WWF Guyana, WWF LAC, WWF International through the Sea Turtles Global Program, and Sea Turtle Conservation Bonaire as a regional partner. Its objective is to develop actions, cooperation and financing opportunities to support conservation actions in the Caribbean from a regional level. The Alliance’s conservation strategy includes four basic pillar: Marine Protected Areas (MPA’s), corals, sea turtles and sharks, sustainable tourism as an opportunity to promote development and climate change as a common topic which interacts with the prioritize conservation topics. Some of the meeting’s results were the creation of the CMA working plan, which includes on the sea turtle components, working mainly with IAC and WIDECAST in the topic of the impacts of climate change on sea turtle habitats and promoting capacity building and information exchange. Moreover, IAC Secretary held meeting with Suriname environment authorities to discuss the country’s possibility to start the adhesion to the IAC Convention. Seventh Meeting of the Consultative Committee of Experts. IAC celebrated the seventh meeting of the Consultative Committee of Experts on Stetson University, College of Law, located in Gulport, Florida on June 4th -6th. The event was opened by Ms. Theresa J. Pulley Radwan, Associate Dean for Administrative and Business Affairs and Professor of the Stetson University College of Law, who welcomed delegates of 8 Member Countries, 7 sectorial members in representation of NGOs, scientific and private sector associated to IAC and accredited observers such as the Sargasso Sea Alliance (SSA). 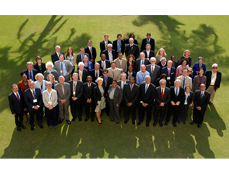 the Faculty of Law of Stetson University and the Chair of the Scientific and Technical Review Panel of the Ramsar Convention (STRP). During the sessions the participants reviewed the level of compliance of the IAC Technical Resolutions according to the information provided on the 2013 and 2014 annual reports. 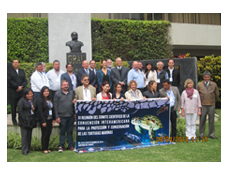 Updated the CCE work plan for 2014-2015, reviewed documents elaborated by the 10th Meeting of the Scientific Committee, reviewed progress of activities of the Working Group on the Eastern Pacific leatherback and discussed strategies for IAC collaboration with relevant international organizations. In addition, the plenary reviewed the Exception document submitted by Costa Rica in its 2014 annual report for Ostional beach in accordance with Article IV paragraph 3 (abd) and Annex IV of the Convention text. As part of the meeting, the participants enjoyed the hospitality of Stetson University and its partners, who organized a reception at the University of South Florida. This event was opened by the Mayor of St. Petersburg City, Mr. Rick Kriseman, who welcomed the participants. Also during the field trip, participants had the opportunity to visit the installations of the Rehabilitation and Research Center of sea turtles at the Florida Aquarium, and had an exchange of experiences on rehabilitation and the main issues found in Florida and South America. Sea Turtles Conservation Activities in Chile. In the Region of Arica and Parinacota, specifically in the sector of "La Puntilla" in Playa Chinchorro, there is a feeding area for young black female turtles. This sector is located within Arica’s urban area, which conveys a unique space for the specie in the country. It also entails a set of threats not found in other areas: primarily related to urban developing, the increasing use of the coastline, polluting agents and others. Therefore, in 2009 with the creation of the Regional Board of Sea Turtles, which is chaired by the Zonal Directorate of Fisheries and Aquaculture of regions IV, I and II of the Subsecretariat of Fisheries and Aquaculture, and the participations of different related public services of the XV Region. One of the important milestone to be highlighted is that the Regional Government of Arica and Parinacota, funded in 2011 the Marine Turtle Conservation Program, executed by the Arturo Prat University (Tortumar-Chile). This Study serves as a base to obtain technical and scientific information on which the Regional Board of Sea Turtle is currently working in order to evaluate the possibility of establishing a Protected Area. Therefore, it would provide a figure of legal protection, for both the species and foraging habitat. IAC and Bermuda Government begin dialogue for its accession. On March 14th, IAC Secretary PT had a meeting in Hamilton, Bermuda with Dr. Drew Pettit, Director of Conservation Services of the Ministry of Public Works of the Government of Bermuda and Dr. Ian Walker, Principal Curator, Bermuda Aquarium, Museum and Zoo. This meeting is the first step to the consultation process for the accession of Bermuda to the IAC. The result from the dialogue was positive, as it recognized that Bermuda already fulfills most of the requirements to become a IAC Member Party. Bermuda is an important area for sea turtles foraging, development and growth, and plays a critical role in the global conservation of sea turtles. There is a history of sea turtle protection legislation that goes back to the 1600’s and a long time series of data collection dating back to 1960. Also, there is a solid base of scientific knowledge and understanding of sea turtles in Bermuda. We will continue to work with our colleagues in Bermuda to support their accession to IAC in the near future. IAC highlights the importance of conserving the Sargasso Sea as a key sea turtle habitat. 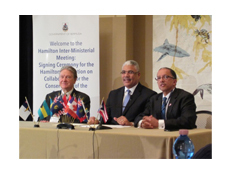 On March 11th, The IAC Secretary Pro Tempore, Ms. Veronica Caceres attended the signing of the Hamilton Declaration meeting organized by the Government of Bermuda and the Sargasso Sea Alliance (SSA) in support of the conservation of the Sargasso Sea as key habitat for sea turtles in the central Atlantic. IAC Secretary PT gave a presentation on the importance of the area for juvenile green, hawksbill, loggerhead and leatherback sea turtles as refuge, foraging and growth habitat. In this meeting, the Governments of Bermuda, the Azores, Monaco, United Kingdom and the United States signed the Hamilton Declaration on Collaboration for the Conservation of the Sargasso Sea. Representatives from Sweden, Turks and Caicos Islands, British Virgin Islands, the Netherlands, Bahamas and South Africa expressed support for the Declaration. It was also supported by five International organizations: Inter-American Convention for the Protection and Conservation of Sea Turtles the Convention (IAC), the Convention on Migratory Species (CMS), the Oslo and Paris Commission, the International Seabed Authority, and International Union for the Conservation of Nature (IUCN). The ‘Hamilton Declaration’ is a non-binding political statement, which seeks protection for the Sargasso Sea using international bodies that regulate areas beyond national jurisdiction. It will provide a platform for the creation of a Sargasso Sea Commission, whose aim will be to minimize the adverse effects of shipping and fishing in the area, keeping it healthy and productive. The Sargasso Sea is characterized for its floating Sargassum seaweeds which sustain and protect a wide variety of species. Some of them, like the Sargassum anglerfish, are unique to the area, and others like the eels and hawksbill sea turtles are critically endangered. In spite of its ecological importance, the area faces numerous threats which undermine its long-term viability and the species it maintain. These include wastewater discharge from ships, pollution, fishing, harvesting of Sargassum algae for fertilizer and biofuel production, seabed mining, climate change and ocean acidification. Due to the ecological importance of the Sargasso Sea as crucial habitat for endangered sea turtles, the IAC and the Sargasso Sea Alliance would like to maximize collaboration to exchange scientific information, and expertise with the aim of protecting and managing this key sea turtle habitat in the Atlantic. The Executive Director of the SSA, Mr. David Freestone, identified IAC as a key partner organization to the Sargasso Sea Alliance. Currently, both organizations are planning their scientific collaboration aimed at improving the understanding of the sea turtles use and benefits of the Sargasso Sea habitat. Organizing a Monitoring Program for Nesting beaches in Curaçao. The IAC Secretary PT, Ms. Veronica Caceres Ch., Mr. Paul Hoetjes, IAC Caribbean Netherlands Focal Point and Ms. Mabel Nava, Director of Sea Turtle Conservation Bonaire (STCB) visited Curaçao from February 18-19, 2014 to attend technical meetings with the Secretary General of the Ministry of Health, Environment and Nature, officers from the Ministry of Foreign Relations and representatives from local scientific institution Carmabi and conservation NGO Uniek Curaçao in order to organize the work plan for the first sea turtle monitoring program in Curaçao. 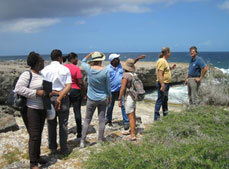 During the visit, Curaçao’s technical team identified its first index beach at Parke Nashonal Shete Boka. Furthermore, a program was proposed to monitor sea turtle nesting activities for the index site. This program will be funded by the Ministry of Health, Environment and Nature of Curaçao and it will receive initial support from partners in the region such as Bonaire and IAC colleagues in Barbados. To operate the program, a team composed of a field coordinator and two data collectors were identified. The data collectors will receive their training on species identification, nests, tracks identification, and data storage in Barbados. Once the training is concluded, the STCB will continue the training in Curaçao to build local capacity with park rangers and representatives from the Government and local environmental NGO’s. Data analysis will be done with support from Carmabi and the results will be included in the IAC Annual Report. Curaçao’s nesting beach monitoring program is an excellent example of how collaboration among IAC Contracting Parties, Government authorities, local and international NGO's, scientific institutions and other stakeholders with the assistance of the IAC Secretariat PT can create synergies to significantly contribute to the regional efforts for the conservation of sea turtles.